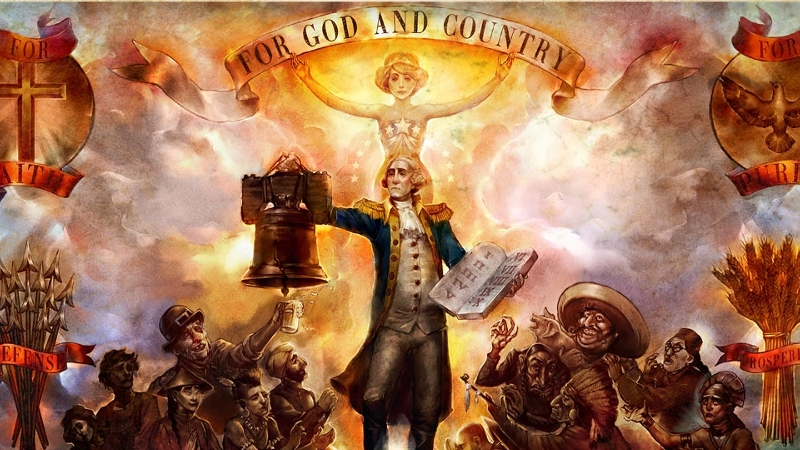 Just in case you thought the recent staff departures from the team, delays, and game mode cancellations meant that BioShock Infinite’s development might be in some trouble, Kevin Levine & Co. have dropped a new trailer with a hard rocking soundtrack to remind everybody to stand tall for the Beast of America, lay down like a naked dead body, keep it real for the people working overtime – they can’t stay living off the government’s dime. The trailer shows off the series’ trademark madness, prominently featuring Bioshock Infinite’s all-new, all-radical Sky-Hook aerial grappling action. We also get a glimpse at some of the game’s locations, including Monument Park and Battleship Bay, as well as the Handyman and a totally creepy Boy of Silence. Most importantly, perhaps, the trailer (re-)confirms a 26 February 2013 launch, so apparently everything over at Irrational Games is still happening on schedule. Until it isn’t, anyway, but is a man not entitled to some optimism?